Thank you very much for being with us during this year. Your help and support provided us with a chance to make more than you think. We were able not only accomplish all of the initial goals for 2017, but exceed them and address larger causes than expected. 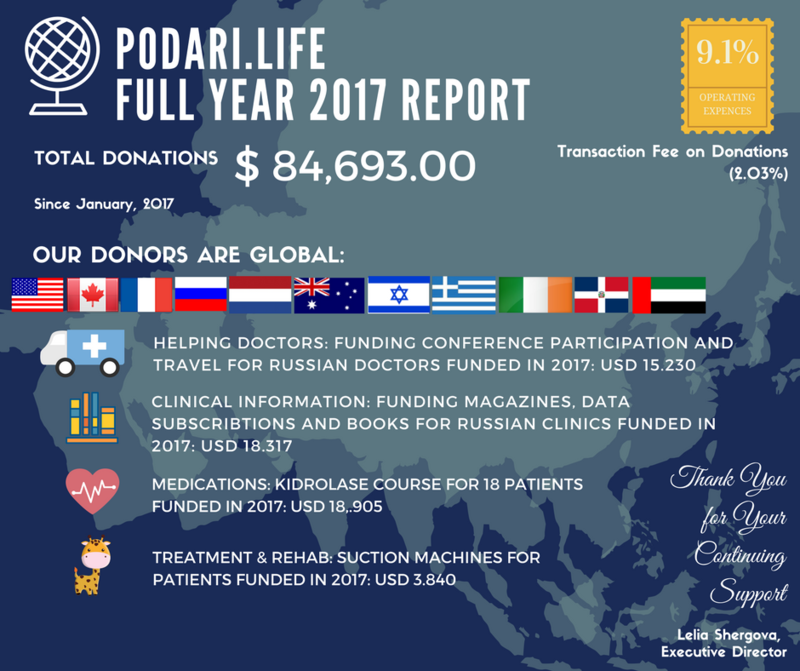 Besides subscription to different scientific journals (2017 and 2018) and ongoing support to academic exchange between Russian and American doctors, you helped Podari.Life to raise money to enlarge medical libraries with contemporary manuals, disease atlases and reference books - while they have very particular cost, they are a priceless piece of knowledge so necessary to provide Russian children with diagnostics and treatment. Podari.Life also - with you kind support - bought and delivered to Russia 15 “Giraffes”, special suction machines designed for kids. But this is not all: this year we were able to buy some important medications i.e. Kidrolase that will help 18 kids fighting specific form of cancer at Dima Rogachev Pediatric Hospital. In November we also started to accept donation in bitcoins and other cryptocurrencies. That was an amazing success! Our anonymous donors gave us more than 86 bitcoins! We believe that it is a huge opportunity for us to stand up for larger causes, providing funding and assistance in fighting childhood cancer in Russia and other former Soviet republics. For all our three charities, Russian "Podari Zhizn" Foundation, UK-based "Gift of Life" and "Podari.Life" this year was a display of a miracle of your generosity. On behalf on those who need your help and support we condone our wholehearted thanks to you for your effort to make the world a better place. We also hope you continue to support us, and we are short in words to say how much we appreciate your trust. I hope to provide you soon - sometime in January - with our plans for 2018 and further updates regarding Podari.Life development. Undoubtedly, we have bigger goals and tougher challenges ahead, but I want to reiterate: with you, we are convinced to succeed! Happy New Year 2018! I hope we’ll be together.